Based at Hamble Point Marina, Southampton with immediate access to the Solent, we are a fully recognised RYA Training Centre offering a full range of RYA Practical Sail Cruising Courses, own boat tuition, and private sail training, using our extensive fleet of well maintained and equipped yachts. 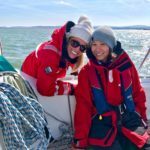 We are the Sea School branch of Hamble Point Yacht Charters, ideally located in the Solent and specialising in the delivery of high quality RYA Sailing courses, own boat tuition and private sail training. Using a wide variety of well maintained and equipped yachts, our experienced, friendly and enthusiastic instructors provide the full range of sail courses and tuition suitable for everyone from the beginner or occasional sailor through to achieving your RYA Yachtmaster Offshore. Please contact us if you have any specific requirements or can’t find the answer to any questions you may have. We had a great time on Empowered, the whole family really enjoyed themselves and it was nice to be able to get some sailing in. 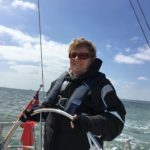 Please pass on our gratitude to Richard, who is an excellent skipper and taught us all a thing or two, it certainly re-ignited my passion to do a bit more sailing. Just wanted to say a huge thank you to Roland for looking after my son and husband so brilliantly this weekend. The course was their Xmas present from me and they absolutely loved it. John specifically said how nice Roland was and really appreciated how well they were looked after and instructed. Thank you. I don't doubt you will be seeing them again! Brian and I enjoyed our course very much. Steve Penn is an excellent instructor – patient, decisive, clear in his explanations, encouraging and with a brilliant sense of humour – he needed it to put up with us! I certainly feel more confident in my ability to sail and now need to go and practice, practice, practice. I was also very impressed with the way the Bavaria 36 handled. 4 dinghy sailors have just had an excellent weekend yacht sailing in the Solent. We chartered Appaloosa, a Bavaria 36 sailing yacht from Hamble Point Yacht Charters from Friday morning to Sunday afternoon. The booking process was easy and straightforward, and the special low season discount made the weekend good value for money. The yacht itself, was in excellent condition, and the layout below is very sensible for cruising. She was well equipped and I would recommend her to anyone wishing to cruise the South Coast. We 4 adults had plenty of room, although she could take up to 8. Based at Hamble Point meant very easy and quick access to the Solent, and the Ketch Rigger cafe in the marina is a handy place for a crew to assemble while a skipper takes over a boat. We experienced wind F 5-7 most of the time during our weekend, with regular gusts up to F 8 and 9, and even F 10 at one stage. At no time did anyone feel that the yacht was not up to it. The 3 day 170 nm cruise allowed me to hone my day & night passage planning & pilotage skills knowing the ever dependable Roland was at hand to offer tips, improvements & encouragement. I thoroughly recommend HPYC & Roland. Especially his toasties!! We had a fantastic day sailing to Cowes and back. 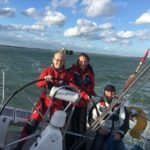 We have zero experience but our captain Roland was so patient and gave all of us the experience if a lifetime sailing in the Solent - we can't wait for our next trip!!!! Professional and friendly and we had a great time on the course but would add that Ian was fantastic. I would want to do my Day Skipper with him that's for sure. 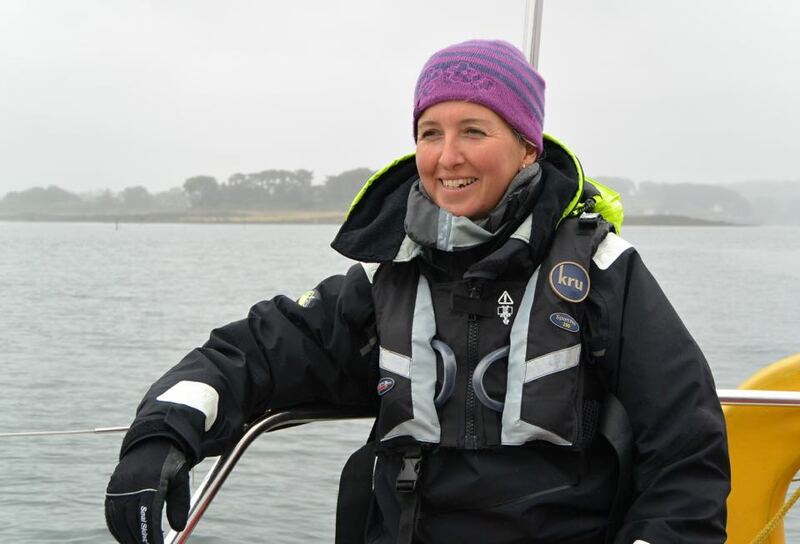 [I] Booked an introduction to sailing (weekend course) with Hamble [Point Sailing School]. The experience was fantastic and I learned much more than the basics thanks to Alex. my instructor and the team. They were patient and generous with their time and knowledge and really nice people. 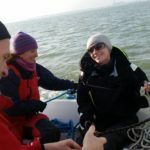 I hoped to like sailing after my weekend - the experience exceeded my expectations and I loved it and will be back to do the Competent Crew Course next. I highly recommend this to anyone thinking of trying sailing. Thank you Alex for an unforgettable introduction to sailing. I went into the weekend hoping to like sailing and have come away loving it. See you soon for the Comp Crew. I also want to thank Josh and Debs for making the weekend such fun and so informative. Thanks guys! Thank you for a wonderful Day Skipper experience! brilliantly organised, wonderful staff, and amazing instructor and crew, fantastic shore based team, high quality hire equipment, well stocked boat, and an amazing five days. I cannot recommend you highly enough! We were made to feel incredibly welcome when we arrived. This approach is vital when trying to attract new people to sailing as it can often be seen, from the outside, as difficult to access. A fabulous weekend sailing with Alex as skipper. An easy and relaxing trip to Poole and back. It was lovely to have the boat fully provisioned for us, and to be able to eat our evening meal on board, whilst making new friends. There was opportunity for us to do as much or little as we wanted to, navigating, helming, working on fore deck etc. The boat (Spirit) was well equipped for us, as are all the Hamble Point Yacht Charter & Sailing School boats. Thank you very much! Thank you again for the fantastic tuition last week. I learnt so much from [Alex.]. [Her] calm and patient manner made a massive difference and really helped my confidence. Just sending you a very big thank you for such an excellent week. [Alex. was] brilliant - so informative and supportive; encouraging and calm; not to mention, good fun and kind. Thank you! I've learnt loads and am now feeling more confident. Super School. They got me out of a hole when a nearby competitor let me down with no notice. Great coastal skipper course with Instructor Tom. Had a great weekend out in the Solent with Hamble Point Charter Skipper and Trainer Paul. I've chartered before from Hamble Point and have always been happy. Karen and Alex are extremely helpful and nothing is too much trouble. This time I wanted to bring my wife Julie and two kids along. 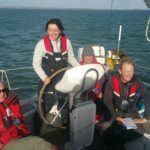 Julie wanted to start her 'Day Skipper' training and as I hadn't skippered a boat for a few years it would be a good refresher for me too. The weather was great which set the scene for the weekend. Paul involved the kids a lot in sailing the yacht, a lot more than I expected; couldn't believe they got up the on the morning of the second day and completed 'engine checks' before we headed off. The kids loved it and can't wait for the next time and of course Julie and I loved to too and will definitely be out with Paul again very soon for much of the same. I chose Hamble Point school from internet as the dates were convenient to me, so glad I made this choice. Those at the school were very quick to respond to my requests and friendly when I got there. The boat we had was in good condition (Jeanneau 37) and the provisions supplied were excellent and plentiful. Although I had all my own gear there was plenty there for the beginner to use. The standard of teaching from John was of the highest quality. 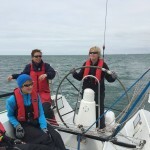 Had never sailed the Solent but it is a great place to sail and hone skills. I picked the school at random but so glad I did, when I return to the Solent they will be top of my list. 5 day yacht Master preparation course arranged through Hamble point Yacht Charters. This was an excellent course and the instructor put a lot of effort into producing an excellent combination of quite intensive learning which combined some theory with practical exercises including night pilotages, and a really enjoyable and entertaining week on board. Definitely recommend it. Great 3 day charter for four of us. The boat was well prepared and Josh, our skipper, helped ensure we had a great time. 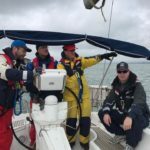 A great trainer for those less experienced in the crew and his planning ensured we had a varied sailing experience in the Solent with well chosen overnight locations. I was very pleased with the Schools quick responses to my initial online booking for the Competent Crew Course and all subsequent communications. I was kept updated about arrangements prior to the course. On arrival the staff and instructor welcomed me warmly and were clear about what I needed to do. On the course the instructor was very clear, helpful and encouraging and also a good companion. I was given plenty of opportunity to develop my practical skills and extend my knowledge and understanding of all that's required to be a good crew member. 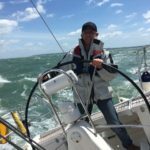 Our instructor is clearly very experienced in sailing completing thousands of sea miles each year and was very approachable with a wealth of anecdotes from his own experience that he was able to use to illustrate many of his teaching points. But he was also happy to patiently explain and answer basic questions and ensure he'd full answered your query. He planned and discussed with us the schedule and its objectives for each day and ensured we completed them successfully. The boat was well equipped and provided all the opportunities to practice the skills we were taught and the school also supplied a good selection of food for the week. The cost was reasonable just for an enjoyable weeks sailing, but when you add all the instruction and opportunities for practicing the skills taught it was excellent value. I left feeling well prepared to act as a crew member on a boat, and am enthusiastic to develop my skills further. Could you thank Martin for me for an excellent course and a fun week, please?. I was a bit dubious, as I’m sure he noticed, about sailing around Southampton docks but his teaching locations and style were very effective. I’m much more confident about my ability to take a boat out as skipper. Amazing course. This company managed to put together a bespoke set of training for us with an extremely capable and experienced skipper together with an excellent boat. The location enabled us to experience so much over the time on the course. Great training weekend where I could practice skills I learnt on my Day Skipper 3 years ago, but had not really practised since e.g. MOB under power & under sail, picking up a buoy under sail and mooring in various spaces and marinas. The instructor (John) was absolutely excellent. He was really knowledgeable and experienced and gave really clear explanations, both by drawing diagrams, demonstrations and talking us through what we were about to do. There was plenty of space on-board the yacht (38ft Bavaria) for three of us in total. Supplied food was fine and there was plenty of it. I borrowed waterproofs which were included as part of the course fee. These were in good condition. The whole course was really relaxed and informative. All-in-all it was a thoroughly enjoyable weekend. I just wanted to drop you a quick note to say how much I enjoyed the Day Skipper course last week. I feel like I learnt a huge amount and benefitted from great company and the experience of a great instructor. I wouldn’t hesitate to recommend your course to others. 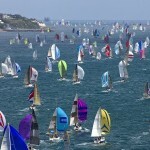 New course added - Pre Flotilla Training!